With a tap of M3 or less the normal tap handle is too big, but small tap holders are rarely a serious thing. 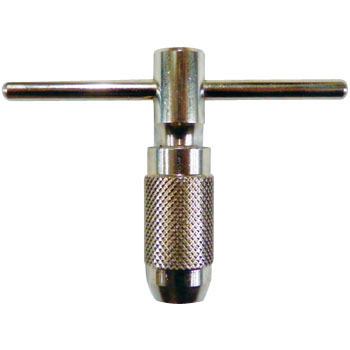 Since knurling is difficult to turn, if you can turn this part with a wrench, you can secure tap holding power and it will be easier to use, but please do something about the manufacturer. Also, if you extend the T part of the tap handle to 8 to 10 cm so that it can be rotated quickly, it will become easier to use. In the case of a small tap, there is a different request from the normal tap handle, so even if it costs twice, I will buy it. This review is about item#10249136. It is easy to fix the tap, it is easy to hold the tap vertically. I felt it was a little hard to tighten the knurled knurls with hands, but when applying grease to the internal thread only a little improvement was done. I think that it will improve well while using it. This review is about item#10249145. Although it is inexpensive, there is no hindrance in use. I think that it is good to increase the tightening force of the place where knurled processing is done. Other sizes, including other companies, I want the one that can be tightened and removed strongly by hand tightening. It is small and easy to use and satisfying. Since rotation of the holder nut is astringent at the beginning of use, it is refueled and used for several times to use it. Very easy to use. It is good that the handle is not too long. There are those who can not fix the chuck, but probably I think that the usage method is wrong. Because it is a 4 point chuck, it is ideal for fixing bytes. If the pilot hole sizes are matched, small diameter threading can be done without putting too much force. When putting 1 piece in the workshop, it is saved soon in time to make a tap. I think that it is normal as a product, but I am saved in time in case of emergency. How to fix with a round chuck (although it is not in the image) to add a square tap ... Even if there is a size that can be barely gripped, you can not do a decent work. Since I can see a good evaluation, I reviewed it, but I still do not know how to use it. It is a square chuck seen in the ratchet type, not a ratchet type, I want a very small one. Removal of coating film adhering to thread after painting, cleaning thread. I grabbed the spiral tap of M4 and tried to rotate, but it rolled. There is no meaning of the holder because the use range written in the explanation and the actual insertable size do not match, so it can not be used with this. In the end, without using a holder, I used the hand tapped axis directly by hand. After purchase, other people also had similar impressions, care should be taken when neglecting to confirm at the time of purchase.